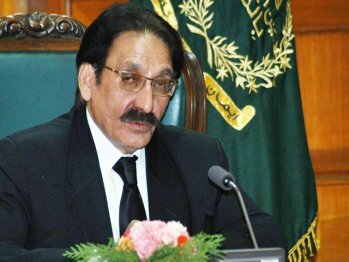 ISLAMABAD – Heading a four-member Supreme Court bench on Wednesday, Chief Justice of Pakistan (CJP) Iftikhar Muhammad Chaudhry observed that Pakistan was a sovereign state with a potential to foil any foreign conspiracy. “Until the time we maintain our sovereignty, no conspiracy can be hatched against the integrity of the country,” he said. The bench, also consisting of Justice Muhammad Sair Ali, Justice Ghulam Rabbani and Justice Khalilur Rehman Ramday, was hearing a number of petitions against the lease of Reko Diq gold and copper reserves in Balochistan to a foreign exploration and mining company, Tethyan Copper Company (TCC), a Canadian and Chilean consortium of Barrick Gold and Antofagasta Minerals, by the federal and provincial governments in violation of law. Resuming his arguments, Ahmad Raza Kasuri, lawyer for the Sanjrani tribe, said the award of exploration licenses to BHP Company was an attack on the sovereignty of the country. He said the foreign company engaged in Reko Diq mines could prove to be an “East India Company”, as it would establish schools in the area where local children could be brain washed. He said conspiracies were being hatched against the sovereignty of the country. “The issue is not before us”, the chief justice said. The counsel read out some information which he downloaded from internet over the Reko Diq deal, but the court asked him to verify the source and provide the details to all parties concerned. “Everything has to authentic and verified”, Justice Muhammad Sair Ali said. “We go strictly according to the law,” the chief justice observed, directing the lawyer to restrict him only to the law points instead of indulging in politics. Abdul Hafeez Pirzada, lawyer for BHP, will commence his arguments today (Thursday). Earlier, Dr Salahuddin Mengal, the Balochistan advocate general, produced before the court the record of the Reko Diq deal, however, he told the court that the record pertaining to joint venture agreement with the BHP and the notification for relaxation of rules for grant of exploration license, was not available as yet. He said that until 2002, the Ministry of Industries and Commerce was dealing with the matters pertaining to relaxation of rules for awarding exploration licences to foreign companies, however, it was being dealt by the Mineral Department now.